Its been a busy month gearing up for the holidays so its also been hard to sit down and post stories. I am finishing up a couple of other projects (including my book on Cassin Young) but ran across this story while researching old Navy stories. 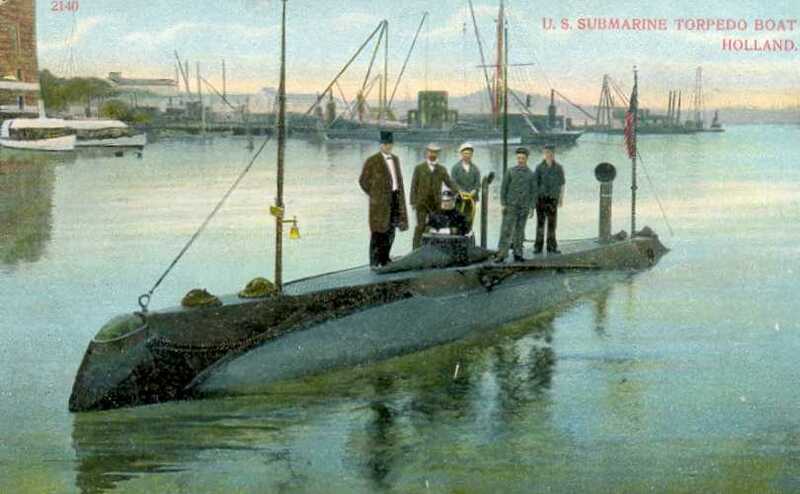 Traditionally, the official start of the American Submarine Service is dated to April 1900 since that is when the first boats were actually purchased. I know that it actually goes back to the Revolutionary War and the Turtle, but the purchase of a steel boat in 1900 is a much more arguable date for the submarine since that date really launched a submersible that could dive, surface, maneuver, attack and hide for increasingly longer periods of time. I love exploring the archives for relatively unique stories and this is certainly one of those. This book was published in 1898 so the stories in it were probably from around that time. It is two years before the Holland became a reality for the Navy and has an interesting perspective about submarine life. Related Names: Rawson, Jonathan b. 1871. Published: New York, J.A. Rawson, Jr. & F.S. Crawford, 1898. The United States’ newest naval wonder is the Holland submarine boat which, in any war that might break out at the present day, might play a part not less important than that left for the Monitor in the Civil War. After years of persistent study and experiment, Joseph P. Holland, the inventor of the boat, has proved that his strange craft is not a myth, and that navigation under the sea is not impossible, but that in naval warfare it may be hereafter a most profitable method of marine locomotion for the person who knows the secret of the art, and a most dangerous and destructive thing for that person’s enemies. Holland’s boat is 50 feet 3 inches long, with a four- foot screw-protecting extension. Its diameter is 10 feet 3 inches amidships. It was designed to travel ten knots on the surface or eight knots under water for eight hours. Power is supplied by a gasoline engine and a dynamo operated by a storage battery. When the boat is submerged the dynamo is used, and when on the surface the gasoline engine is the propelling power. While on the ways the boat has the appearance of a cigar-shaped, hermetically sealed tube. The hull is of steel plating, riveted to steel frames. The plates are half an inch thick amidships and taper to one-eighth of an inch at bow and stern. A telescopic conning tower, 2 feet in diameter, rises from the center of the boat. Four rudders control the movements of the craft, and there are three propellers, each of which is 4 feet 9 inches in diameter. The gasoline engine is of 48 horse-power, and the dynamo, when the storage battery is fully charged, is capable of exerting 150 horse-power. Her Method of Attack. In approaching an enemy’s battleship the Holland is kept just below the surface until within range of her guns. Then the boat descends twenty or thirty feet below the surface and moves forward to within a mile of the enemy, when it comes to the surface for a moment. During that moment the operator, by use of the steering gear, points his boat directly at the battleship, thus aiming the bow gun, and at a signal from him the gun is discharged, throwing a dynamite shell at the enemy. Before the shot can be effectively returned the operator releases the valves which sink the Holland out of the way of the guns of the battleship. Approaching broadside of the battleship, and remaining below the surface, the Holland projects a Whitehead torpedo from its second bow tube. Passing under the ship, it rises to the surface on the other side and a shell from the stern gun is discharged at the enemy. If none of these missiles has placed the enemy /tors de combat, the Holland makes a wide circuit and repeats the attack. So little surface is offered as a target that the Holland’s chances of being hit are much less than those of a battleship or cruiser which it might attack. The submarine fighter’s greatest danger would be from the torpedoes which a ship would discharge. As many men-of-war are equipped with torpedo tubes in bow and stern only, the Holland would be comparatively safe while it kept on the enemy’s beam. No provision is made for sleeping or even for cooking inside the boat. It is built for business only. There is room for ten men, although not more than six are needed to operate the boat. Water tanks are employed to submerge and raise the boat. They are controlled by large Kingstone valves. The boat is submerged by letting water into the tanks, which are distributed forward, aft and amidships, so that the craft remains on an even keel. Water can be admitted so rapidly that the boat will descend thirty or forty feet from the surface in less than a minute. When the boat is to be raised a button is pressed which releases the valves and turns on compressed air, throwing out the water with terrific force. The air tanks are capable of standing a pressure of 3,000 pounds to the square inch, and will supply air for the crew for nine or ten hours. Electric lights and bells and speaking tubes are provided. The armament of the Holland consists of three torpedo tubes. One is on the upper bow of the boat, being an aerial torpedo thrower, with a range of one mile. Six projectiles, weighing 180 pounds each, with charges of 100 pounds of high power explosives, can be carried for this gun. Almost directly beneath the torpedo thrower is an expulsion tube for Whitehead torpedoes. As each of these torpedoes weighs 850 pounds, only three are to be carried when the boat is in active service. In addition to the forward tubes there is a submarine gun in the stern of the boat. This, with a 100-pound charge of explosives, can force a 100-pound projectile 100 yards or more through the water. Five projectiles for the stern gun are carried. The Holland that was delivered was a bit different from the one advertised by the newspaperman who wrote this article. But it did start an amazing journey for the US Navy that continues to this very day. I wonder sometimes what they will say about our “ancient boats” someday and how primitive we seem to them.